‘Room 125, Westbank Motel, Idaho Falls, Idaho, July 18 1973.’ by Stephen Shore. It looks like the most casual of snapshots, the illustration of the rigour and anonymity of a motel room after a long day of travelling – the classic image that American photographer Stephen Shore has been known for, since, in the early 1970s, he decided to embark on a series of road trips from New England to Texas with the intention to create a visual diary of his journey by documenting meals, hotels, petrol stations, cars and the whole set of characters that populate that vast and somehow uniform part of the country, filling the distance between one big urban centre and another. Then, at closer inspection, the initial impression slowly begins to unfold. The stretched legs of the author on the bed don’t match the position of the camera, which, significantly, has been set up on a tripod beforehand; the view outside the window has been studiously washed out, but a tiny version of the exterior landscape is visible, reflected on the television screen overhead, juxtaposed with images coming from the flickering black and white TV set; and finally, the late afternoon lighting is vividly present, unfiltered from flash bulbs, bathing each corner of the space and highlighting its natural colours. Even the square format of the picture, distant from the standard postcard frame that characterized Shore’s previous efforts, seems to reflect a change, with the subtle gap between the position of the photographer and his camera, indicating the frustration for what is regarded as an evident perspective limit. 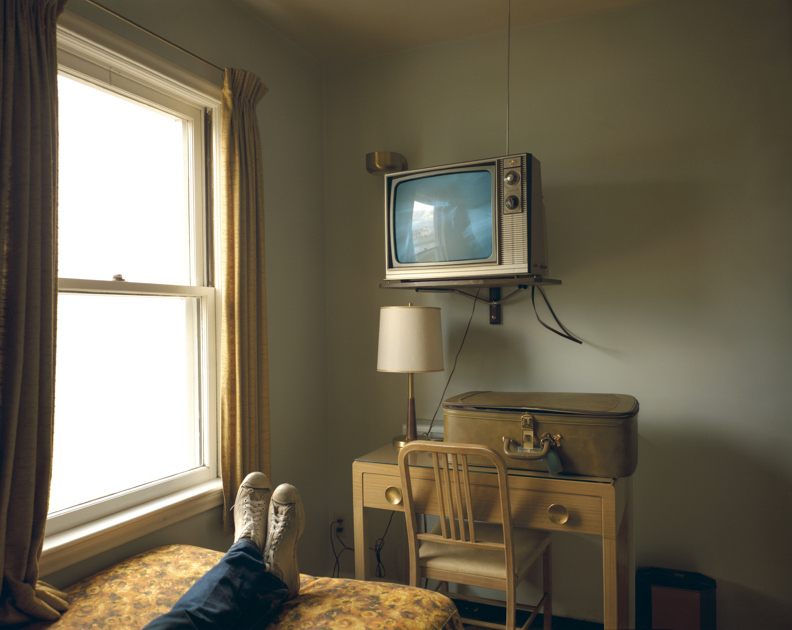 ‘Room 125, Westbank Motel, Idaho Falls, Idaho, July 18 1973’ is part of ‘Uncommon Places’, Shore’s second colour series after ‘American Surfaces’, and the first one featuring a 4×5 view camera – a rather unpopular device in the 1970s. It follows his traditional method of naming his photographs according to location and date, but rarely a title could have been more misleading. An attentive glance gradually erodes the protagonist status of the room to disclose what is fundamentally a self-portrait – that particular moment of introspection and reflection that artists occasionally feel compelled to capture. Photography entertains an ambivalent relationship with reality. It is an argument that has kept some of the finest minds busy since the arrival of the medium. Shore himself has touched on the subject in several of his interviews by declaring that to a certain degree photography will always be a semi-fictional representational form due to the photographer’s decision-making power on when and how to shoot. It’s a logical if not simple explanation, but one that doesn’t quite settle the issue in a fully satisfactory manner, especially when matched with the carefully choreographed qualities of ‘Room 125, Westbank Motel, Idaho Falls, Idaho, July 18 1973’. Far from being a passive interpretation of reality, Shore’s photograph deliberately hides itself behind a smokescreen of ordinariness to mine the perception of the viewer, calling into question his/her role, as well as the one of the photographer, in determining the nature of the subject. In this picture, the common notion of the role of the photograph as a truth-revealing instrument is quietly but authoritatively challenged from the inside out, simultaneously staging all the restrictions and advantages of the medium. Michele Robecchi is a writer and curator based in London. A former editor of Contemporary Magazine (2005-2007), he is currently an editor for contemporary art at Phaidon Press and a visiting lecturer at Christie’s Education. He regularly contributes catalogue essays and magazine articles for publications such as Art in America, Flash Art, Interview, Kunst Bulletin, and Mousse, and is the author of a monograph on the work of Sarah Lucas, published by Electa in 2007. Posted on January 25, 2012 December 8, 2016 by vsmallfires	This entry was tagged Idaho, Masters Of photography, Michele Robecchi, Stephen Shore, Uncommon Places. Bookmark the permalink.